Maria was named the first Belarusian impressionist. Her paintings are a wonder weaved from light and air. She took in clean colors of the sky and woods. The color spectrum of her works embodies her ability to observe and transfer those images onto a canvas. Maria’s still life paintings are extremely attractive and contain some mystery in them. They exude romanticism and enigmatic uncertainty. It’s as if her works are not complete and because of that are very special. There are a lot of golden-yellow and emerald green colors in her paintings – those are her favorite tones. “I used to love creating more complicated paintings. They contained a lot of “foreign” details and objects. But lately my stories have become much more simple and laconic,” says Maria. Often times her works also had crooked vases and jam dishes – that was a way to highlight the fragile beauty and vulnerability of the surrounding world. Now her objects are stable and more realistic. 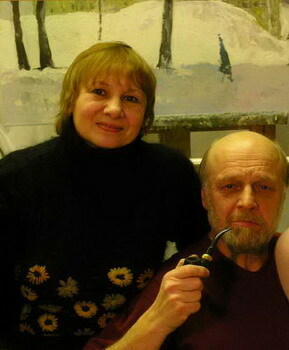 Maria and her husband Nikolay spend an entire summer at their studio in a small village. The earth and flowers give her the energy that transforms into sunny and colorful images in her still life paintings. Maria Isaenok believes that love “makes a person to move forward, helps us to see the beauty of the world and makes us strong. And with this feeling inside we can overcome any obstacles and achieve anything we desire”. Maria Isaenok was born in Kiseli village, Belarus in 1949. She graduated from the Minsk Art College. Maria Isaenok’s works are at the National Art Museum of Belarus, the Museum of Modern Art (Minsk, Belarus), the regional Art Museum of Vitebsk (Vitebsk, Belarus), the funds of the Artists’ Union of Russia, the Art Gallery of Willianova University (Pennsylvania, USA), “Pitter Breigel” art gallery (Holland), the private collections in Belarus, Italy, Russia, Poland, Germany, the USA, Israel, the United Kingdom and Lithuania.